Halloween costumes - Image from Vixen by Micheline Pitt's Facebook page! 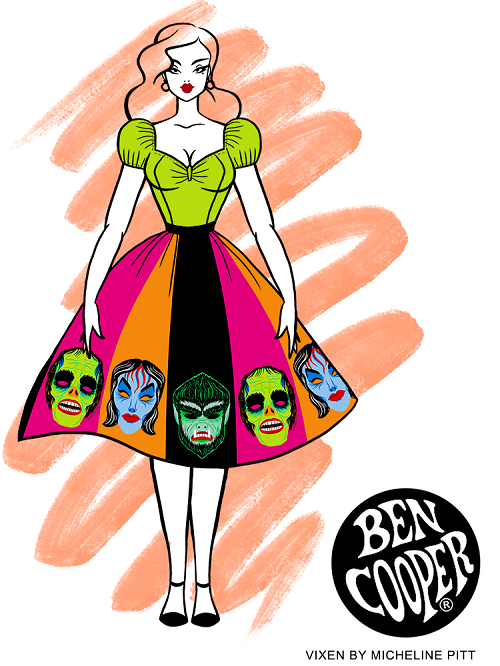 Micheline Pitt's clothing label, Vixen, has partnered with Ben Cooper to create unique novelty prints based on the iconic Ben Cooper Halloween costumes from the 1950's to the 1970's. The prints will be featured on vintage-inspired swing dresses and skirts, sweetheart dresses, pencil skirts, and more! They are available for pre-order on Vixen's online store now, and depending on the style will be in-stock by late July or late August! 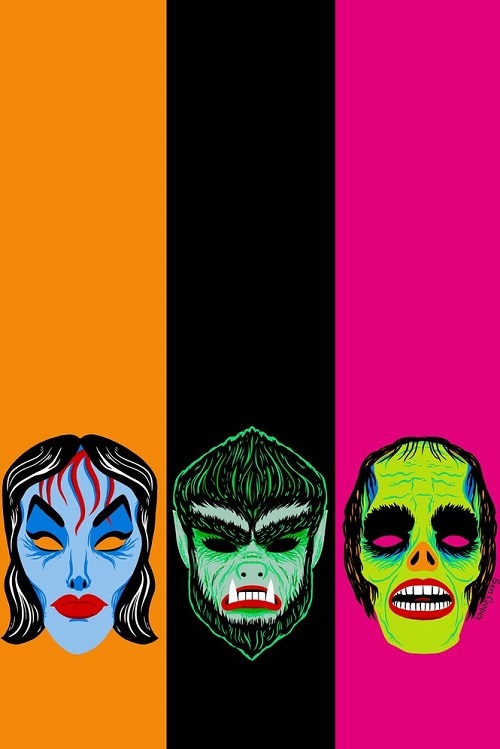 Description from Vixen's site: The "Monster Mask" Print that features the famed "Vampire Girl", Werewolf and Phantom, all based on 1960's masks created by Ben Cooper costumes. The most fabulous full gathered skirt out there, features a 1.75 inch waist band and hidden pockets so deep they will easily hold your iPhone 6-Plus and more! 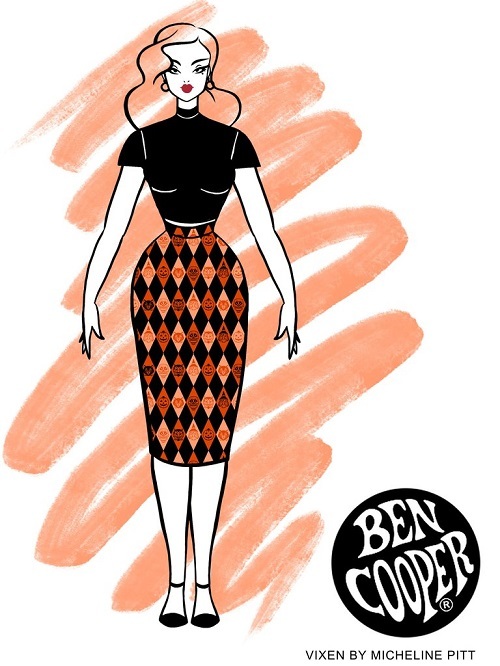 This skirt will nip in your waist and accentuate your hourglass figure to the max. Made of heavy weight "Stretch Cotton Sateen" and stretch fuse waistband. Stock is expected to arrive in late August. 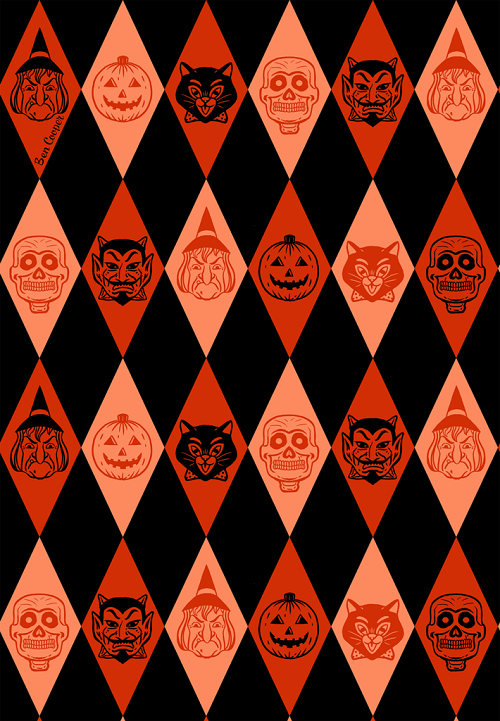 Description from Vixen's site: This print is a replica of that art and has been appropriately named the "Trick R Treat" print. The ultimate sweetheart shaped swing dress, the dress dreams are made of, I know it is made of mine. Made of the softest high quality Cotton/Spandex Stretch Sateen on the market. The bust features a delightful sweetheart neckline and the bodice is fully lined and the front is fused, to give your ladies proper support. The dress features a back zip, SUPER deep pockets big enough for your I-phone 6S PLUS and more, as well as a removable black grommet belt. Stock is expected to arrive in late July. Description from Vixen's site: This print is a replica of that art and has been appropriately named the "Trick R Treat" print. The most DANGEROUS curve killing pencil skirt out there. Made with the shape of your body to nip in your waist and accentuate your hourglass figure to the max. Made of heavy weight "Stretch Cotton Sateen", fully lined in a "Stretch Silky Charmeuse". The fabric is wet printed to insure the deepest pigment and longest lasting effects. Description from Vixen's site: This print is a replica of that art and has been appropriately named the "Trick R Treat" print. The most fabulous full gathered skirt out there, features a 1.75 inch waist band and hidden pockets so deep they will easily hold your iPhone 6-Plus and more! This skirt will nip in your waist and accentuate your hourglass figure to the max. Made of heavy weight "Stretch Cotton Sateen" and stretch fuse waistband. Stock is expected to arrive in late July. 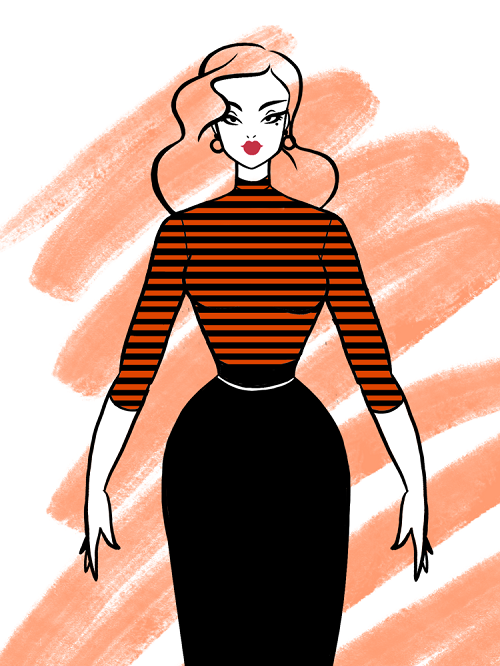 Description from Vixen's site: This is the ultimate vintage inspired striped 3/4 sleeved top for the modern Bad Girl! Made of a custom heavy yet soft knitted striped cotton/poly/spandex. Has no zipper and pulls right on, and is cropped to show just the right amount of skin in your high waisted items. It will surely get you into the right kinds of trouble. Wear it with a bullet bra like shown or with a modern bra for an equally effective look! Arriving at the end of July. 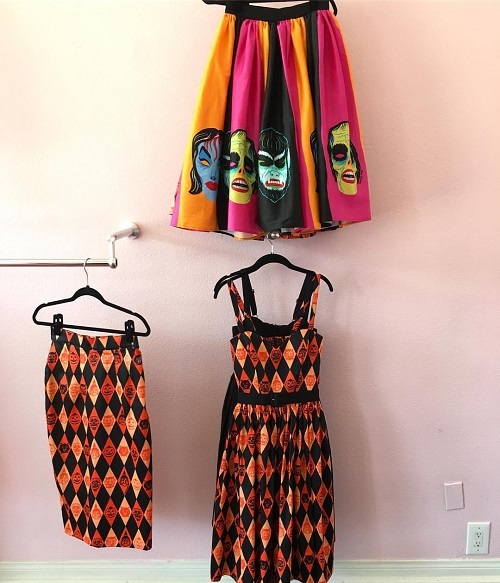 How adorable are these Halloween clothes?! Which one is your favorite? Vixen has plenty of other swoon-worthy vintage-inspired pieces, too! Visit their online store for more OR if you are in the SoCal area you can visit their store opening party on July 22nd in Burbank! RSVP via their Facebook event page (and maybe they will have a few Halloweenie items available!). Only 100 Days to Halloween!